This story was updated at 6:10 p.m. EDT. Coal executive Bob Murray last year presented Trump administration officials with half a dozen draft executive orders aimed at exiting the Paris climate accord and peeling back coal regulations. All President Trump had to do was sign them. The documents, released this afternoon under the Freedom of Information Act to E&E News, reveal new details about a secretive meeting in March of last year among Murray, Energy Secretary Rick Perry and other top agency officials. It does not appear that Trump signed the orders. 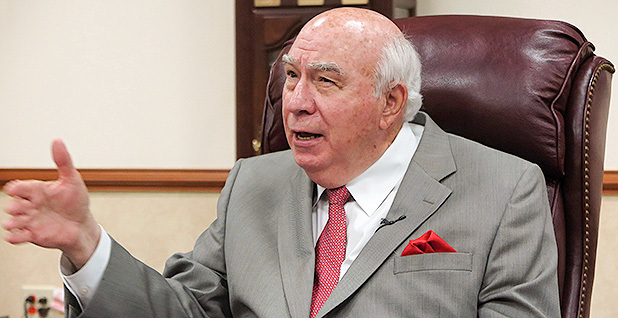 But the documents provide a further glimpse into the Murray Energy Corp. CEO's efforts to persuade the federal government to repeal environmental regulations he deemed a burden to his industry. Parts of the coal executive's proposed action plan have been previously reported, but other elements — like the executive orders — have not. In a series of letters dated March 28, 2017, Murray laid out the orders for Perry and EPA Administrator Scott Pruitt to review and consider, including language to exit the Paris Agreement. Other executive orders called for suspending EPA rules, including regulations for effluent limitations, coal combustion residuals, the utility MACT rule, ozone, and the Mine Safety and Health Administration's dust rule. Murray also called on the Trump administration to direct EPA and Congress to withdraw or suspend the endangerment finding, an action the coal executive included under a section titled, "specific changes that cannot be effected through executive order." Gary Broadbent, a spokesman for Murray, confirmed Murray provided Perry with the documents to "assist in the reversal of the illegal, job-killing, anti-coal regulations of the Obama administration." "Mr. Murray has always sought to secure reliable, low-cost electricity for all Americans, as well as to preserve and protect the jobs and family livelihoods of thousands of coal mining families," Broadbent said. "We applaud the actions taken by President Trump's administration, to date, to protect these jobs and to advance the energy security of the United States." The documents also show the role played by now-EPA Deputy Administrator Andrew Wheeler, who then worked as Murray's lobbyist, in setting up the meeting, where the coal boss presented Perry with a four-page action plan for repealing environmental regulations viewed as burdensome for the coal industry. During his confirmation hearing for the EPA post, Wheeler told senators that he had briefly seen the document and acknowledged taking part in the meeting. The chain of emails shows that Michael Dowling, senior vice president for external affairs at FirstEnergy Corp., sought a meeting with Perry for FirstEnergy CEO Chuck Jones on March 6. Dowling's email, addressed to Perry's chief of staff, Brian McCormack, requests a meeting to address "urgent matters related to our industry and the coal industry." McCormack later responded positively to the meeting request, drawing a response from J. Michael Eckard, director of federal affairs for FirstEnergy. "We owe you. Thanks a million," wrote Eckard. The emails raise new questions about FirstEnergy's efforts to influence policymakers at the Department of Energy. The Akron, Ohio-based utility has been contending with the bankruptcy of its power plant division, FirstEnergy Solutions Corp., and was outspoken in its support for a DOE plan to subsidize faltering coal and nuclear plants. The plan was later rejected by the Federal Energy Regulatory Commission, but a similar proposal that calls on the government to use its emergency powers to save struggling coal and nuclear plants was leaked to Bloomberg News last week. Jones has tried to dispel the notion that FirstEnergy has sought to influence DOE. "I don't think the DOE initiative has anything to do with FirstEnergy, despite what's been reported in some of the media," he told financial analysts in October (Greenwire, Nov. 28, 2017). Dowling, the FirstEnergy vice president, could not initially be reached for comment. Murray Energy officials previously had confirmed meeting with Perry in a March 29, 2017, meeting. The new documents list Murray; Wheeler; and Michael T.W. Carey, vice president of government affairs for Murray Energy, as attendees. DOE did not immediately respond to a request for comment. The documents also include emails showing Wheeler personally trying to arrange a meeting between Perry and another of his lobbying clients, Energy Fuels Inc.
Wheeler helped the uranium mining company successfully lobby the Trump administration to shrink the Bears Ears National Monument in Utah (Greenwire, Dec. 14, 2017).